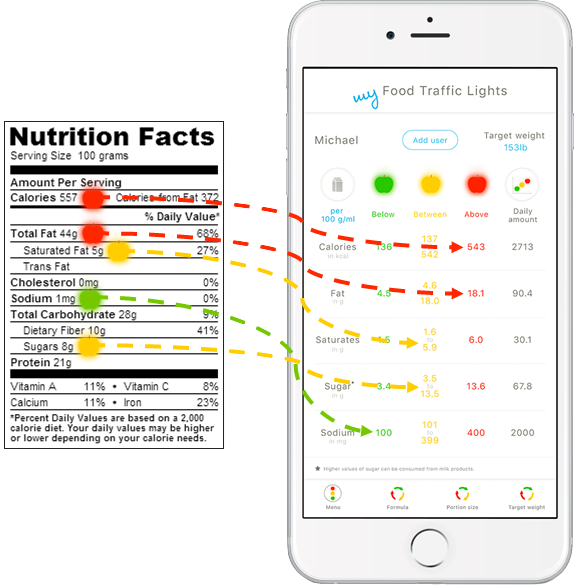 For understanding the Food Traffic Lights on the main screen of the app, it is important understanding the recommended Daily Amounts shown on nutrition labels on food and drinks as well as in the app. On nutrition labels on food and drinks, the Daily Amount may also referred to as Daily Value (USA), Recommended Daily Intake (CAN), Reference Intake (UK), or Nutrient Reference Value (HK). Recommended values on nutrition labels are based only on the requirements of a daily diet of an average woman with a daily calorie requirement of 2,000 kcal. This is to provide clear and consistent information on nutrition labels to achieve a certain degree of comparability. Consequently, Daily Amounts on nutrition labels can only give you a very rough indication of how much calories you need and how a particular nutrient fits into your healthy eating plan for your fitness. Your daily diet is individual! Daily Amounts in the app are calculated based on your personal input data, which we explain to you on the "how the app works" page. Consequently, the Daily Amounts in the app show you the amounts for your recommended intake of calories, fat, saturates, sugar, and salt / sodium based on your personal daily diet. In some countries, traffic light nutrition labels on food and drinks show you at a glance how much fat, saturates, sugar, and salt / sodium are in that food or drink by using traffic lights for low (green), medium (amber), and high (red) amounts for each of these nutrients. The my Food Traffic Lights app uses the same traffic lights model. Food and drinks with green Food Traffic Lights in the app are healthier and to be preferred over those with amber and especially red ones. If you buy a food or drink that has all or mostly green Food Traffic Lights in the app, you know straight away that it's a healthier choice for you. It is then more suitable for your personal fitness as well as for keeping your own weight / BMI or losing weight with a diet. Amber means neither high nor low, so it is ok for you to consume food and drinks with all or mostly amber Food Traffic Lights in the app most of the time. Such food and drinks generally do not harm your health and fitness. 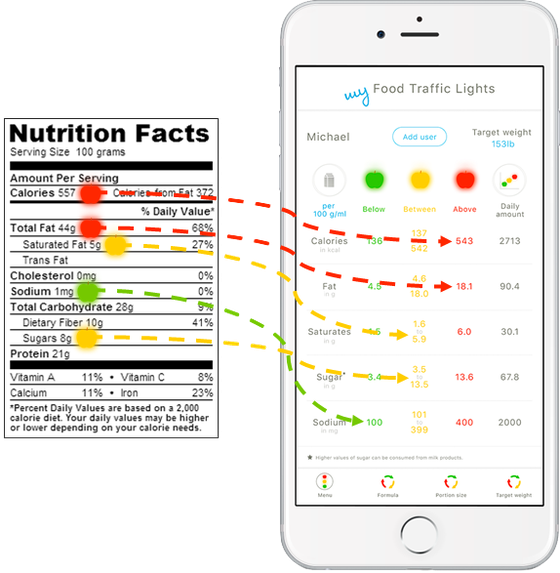 Any red traffic lights in the app mean that based on your personal nutrition recommendations a food or drink is high in a specific nutrient. These are the products you should cut down on. Try to consume such food and drinks less often and only in small amounts. But, it is ok using such products as ingredients for a meal together with other ingredients, which do not have a red Food Traffic Light for the same nutrient. E.g., olive oil is high in fat, but it is not a bad food at all. It is a fantastic and healthy ingredient in many meals. You can combine it with any other ingredients, which preferably do not have a red Food Traffic Light for fat. We were supported by Social Impact Lab and the German Federal Ministry of Economic Affairs and Energy (INVEST).